(Nanowerk News) A team of American and Chinese researchers has developed a new tool that could aid in the quest for better batteries and fuel cells. Although battery technology has come a long way since Alessandro Volta first stacked metal discs in a "voltaic pile" to generate electricity, major improvements are still needed to meet the energy challenges of the future, such as powering electric cars and storing renewable energy cheaply and efficiently. The key to the needed improvements likely lies in the nanoscale, said Jiangyu Li, a professor of Mechanical Engineering at the University of Washington in Seattle. The nanoscale is a realm so tiny that the movement of a few atoms or molecules can shift the landscape. Li and his colleagues have built a new window into this world to help scientists better understand how batteries really work. They describe their nanoscale probe in the Journal of Applied Physics ("Scanning thermo-ionic microscopy for probing local electrochemistry at the nanoscale"). Batteries, and their close kin fuel cells, produce electricity through chemical reactions. The rates at which these reactions occur determine how fast the battery can charge, how much power it can provide, and how quickly it degrades. Although the material in a battery electrode may look uniform to the human eye, to the atoms themselves, the environment is surprisingly diverse. 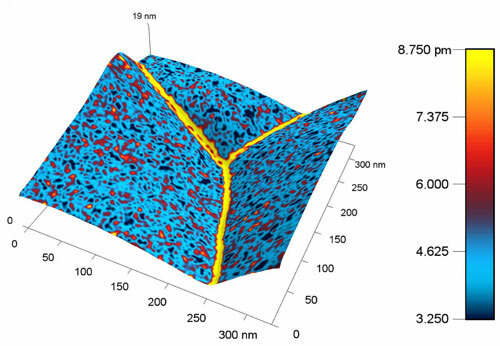 Near the surface and at the interfaces between materials, huge shifts in properties can occur -- and the shifts can affect the reaction rates in complex and difficult-to-understand ways. Research in the last ten to fifteen years has revealed just how much local variations in material properties can affect the performance of batteries and other electrochemical systems, Li said. The complex nanoscale landscape makes it tricky to fully understand what's going on, but "it may also create new opportunities to engineer materials properties so as to achieve quantum leaps in performance," he said. To get a better understanding of how chemical reactions progress at the level of atoms and molecules, Li and his colleagues developed a nanoscale probe. The method is similar to atomic force microscopies: A tiny cantilever "feels" the material and builds a map of its properties with a resolution of nanometers or smaller. In the case of the new electrochemical probe, the cantilever is heated with an electrical current, causing fluctuations in temperature and localized stress in the material beneath the probe. As a result, atoms and ions within the material move around, causing it to expand and contract. This expansion and contraction causes the cantilever to vibrate, which can be measured accurately using a laser beam shining on the top of the cantilever. If a large concentration of ions or other charged particles exist in the vicinity of the probe tip, changes in their concentration will cause the material to deform further, similar to the way wood swells when it gets wet. The deformation is called Vegard strain. Both Vegard strain and standard thermal expansion affect the vibration of the material, but in different ways. If the vibrations were like musical notes, the thermally-induced Vegard strain is like a harmonic overtone, ringing one octave higher than the note being played, Li explained. The device identifies the Vegard strain-induced vibrations and can extrapolate the concentration of ions and electronic defects near the probe tip. 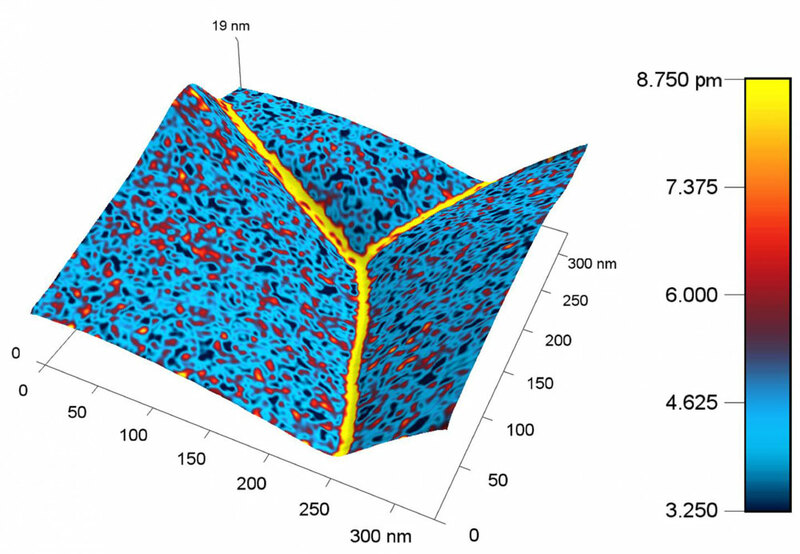 The approach has advantages over other types of atomic microscopy that use voltage perturbations to generate a response, since voltage can produce many different kinds of responses, and it is difficult to isolate the part of the response related to shifts in ionic and electronic defect concentration. Thermal responses are easier to identify, although one disadvantage of the new system is that it can only probe rates slower than the heat transfer processes in the vicinity of the tip. Still, the team believes the new method will offer researchers a valuable tool for studying electrochemical material properties at the nanoscale. They tested it by measuring the concentration of charged species in Sm-doped ceria and LiFePO4, important materials in solid oxide fuel cells and lithium batteries, respectively. "The concentration of ionic and electronic species are often tied to important rate properties of electrochemical materials -- such as surface reactions, interfacial charge transfer, and bulk and surface diffusion -- that govern the device performance," Li said. "By measuring these properties locally on the nanoscale, we can build a much better understanding of how electrochemical systems really work, and thus how to develop new materials with much higher performance."